Photo via Sissy and Marley. Inspired by the current metallic trend? Stake your claim in the new nursery gold rush with sparkling, metallic wallpaper! No need to dig for these precious metals. We’ve already turned up some real gems, and we’re more than happy to share! Just keep scrolling through these shimmering beauties until you strike design gold! Photo via Little Crown Interiors. A classic, floral print goes glam with a modern scale and a metallic-gold sparkle. Little Crown Interiors, $125.00 per roll. A glimmering, gold mosaic on a deep turquoise background. Layla Grace, $110.00 per roll. A metallic-silver damask on a vibrant coral background. Also available in black. Urban Outfitters, $98.00 per roll. Whimsical, woodland-themed wallpaper featuring golden stags on texture-rich kraft paper. A large-scale, floral print in rich teal and metallic gold. Also available in both black and silver and white and silver. Layla Grace, $50.00 per roll. Shimmering, glass-bead embellishments make this geometric beauty shine. Layla Grace, $164.00 per roll. This metallic beauty in chic champagne and grey is printed on temporary wallpaper, making it both removable and repositionable. Burke Décor, $98.00 per roll. Icy-grey fronds scattered on a bed of metallic silver. Burke Décor, $80.00 per roll. 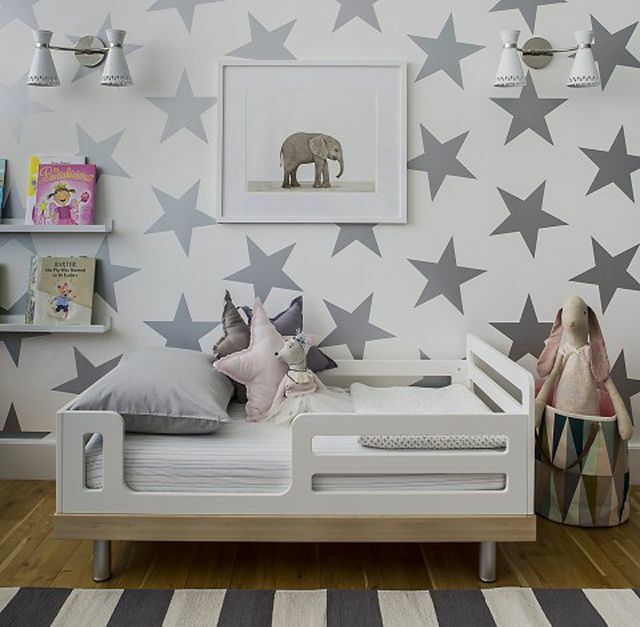 A bold and cheery print featuring metallic-silver stars. Burke Décor, $170.00 per roll. A whimsical sketch of an urban cityscape in metallic-silver and grey. Burke Décor, $44.00 per roll. Inspired by the Ikat patterns of traditional Indonesian textiles, this beautiful print boasts a carefully crafted, metallic-gold chevron pattern set against an aquamarine background. Layla Grace, $84.00 per roll. A sweet, little honeycomb print in a complimentary assortment of shimmering golds. Burke Décor, $70.00 per roll.